Keep your cooking area organized and your utensils by your side with the Stove Accessory Kit. This kit simply hooks on the front or side of your stove allowing you to grab a cooking tool or paper towel the moment you need it. Set includes a 5 hook utensil hanger and paper towel holder. When summer comes around you know it's time to barbeque, and whether you're grilling steaks or burgers you want the best flavour possible. The Deluxe Barbecue Box captures and vaporizes the grease drippings, infusing your food with a rich flavour. A cast iron grill grate and patented heat diffuser plate help minimize hotspots and give you the ability to grill your food to perfection. Fitting on all Camp Chef's 14 inch cooking systems, this barbecue box turns your stove into a grilling machine, outperforming any other portable grill. The Tahoe was built with larger group cooking in mind. Three 30,000 BTU burners and a large 608 sq. inch cooking area gives you the power and flexibility to easily cook multiple items at once. The threesided windscreen blocks upper breezes and the burner housing heat box protects below while also creating larger heating patterns. The Tahoe has built on handles that can adapt to fit shelves and removable legs for easy transportation. Stove Accessory Rack Keep your cooking area organized and your utensils by your side with the Stove Accessory Kit. This kit simply hooks on the front or side of your stove allowing you to grab a cooking tool or paper towel the moment you need it. Set includes a 5 hook utensil hanger and paper towel holder. Stove Accessory Rack is rated 5.0 out of 5 by 3. 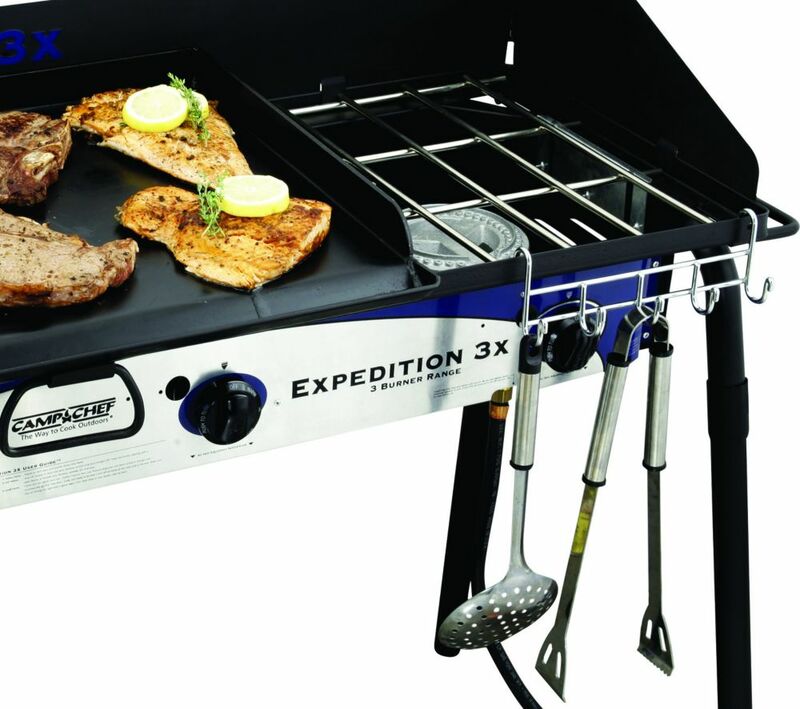 Rated 5 out of 5 by Anonymous from The Grill I used the 3 burner Expo at 2 different camp sites and its great for grilling and cooking. Looking forward on using it at tailgating. Rated 5 out of 5 by Nani from very handy for those grilling tools! Not much to this accessory but very useful for those tongs, lighters and whatever else you use for grilling. I've been wanting one for a long time and finally ordered it! The paper towel hanger is handy as well. Rated 5 out of 5 by Liver the cook from Look no more for paper towel No more reaching & searching for paper towel, its right in front of you.